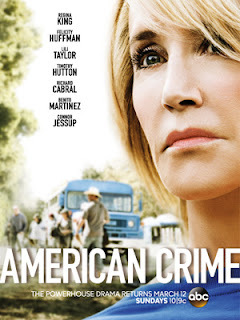 DVR Slave: American Crime is back! Tonight at 8:00 on Cooking it's the 3rd season finale of Dinner at Tiffani's, TruTV has Impractical Jokers and on BBCA it's the 24th season premiere of Top Gear. Up at 9:00 on E! it's the 13th season premiere of Keeping up with the Kardashians, Food has the 3rd season premiere of Spring Baking Championship and NGC has the 6th season premiere of Wicked Tuna. On BBCA at 9:30 it's the 2nd season premiere of Extra Gear. On ABC at 10:00 it's the 3rd season premiere of American Crime and on NGC it's the 3rd season premiere of Port Protection. At 12:12 on AMC it's the 6th season finale of Comic Book Men.